Pop Haydn Video - Pop Haydn's Videos! 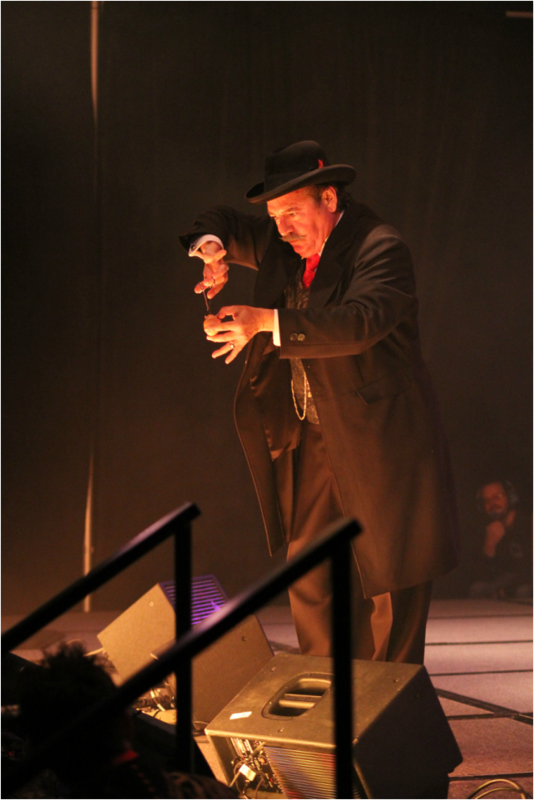 In March, 2015 the Magic Castle in Hollywood awarded Pop Haydn the title Stage Magician of the Year. Pop is a unique and wonderful performer who has been named performer of the year at the Magic Castle seven times. Pop offers a variety of shows that are unique and fun. For corporate events and private parties, Pop offers several types of entertainment with shows that can be fitted to any venue with minimum setup and few technical requirements. 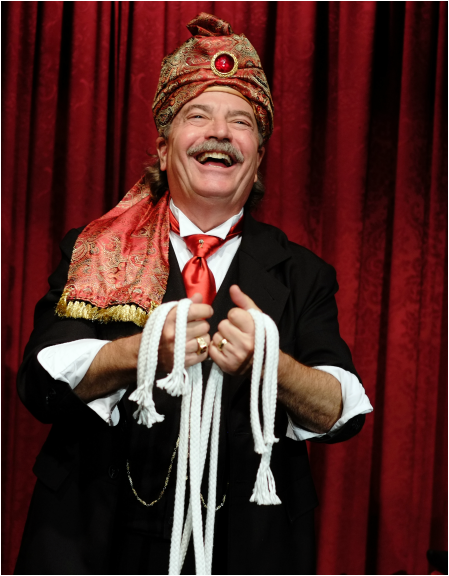 Pop Haydn has twice been named Close Up Magician of the Year and also as W.C. Fields Bar Magician of the Year at the world famous Magic Castle in Hollywood. Close Up magic is magic done with small objects like cards, coins, scarves, balls, etc using sleight of hand. It is meant to be done in intimate surroundings, with the spectators as close as possible to the action. Nothing breaks the ice at an event and gives people something to talk about as much as magic and mindreading performed right in front of your guests. Pop is one of the finest close up performers in the world, and will have your crowd laughing and excited within minutes. Close Up shows can be done for an audience up to 60, or in a station at an event where people come up to the table, or in walk around where the performer moves from table to table or group to group performing for couples and small groups. 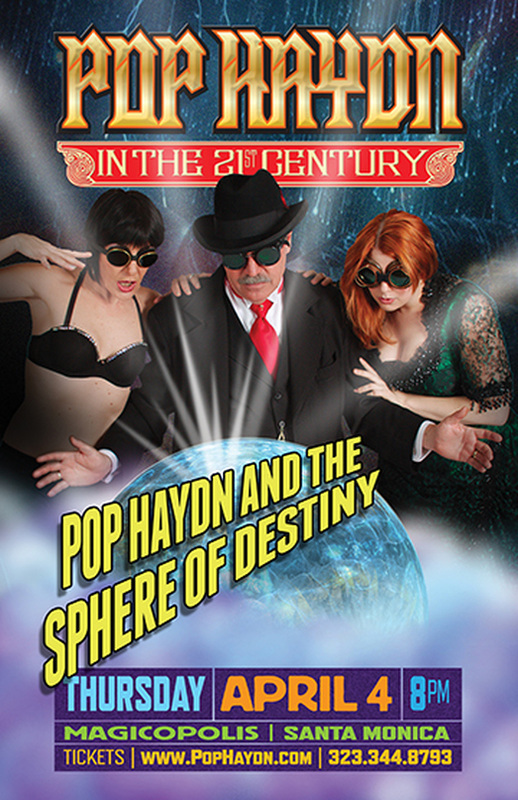 Pop Haydn is not originally from the 21st Century, but as a time-displaced huckster, con man, and vaudevillian he feels right at home in this contemporary era or--in fact--in any environment. Pop is supremely adjustable. On stage, Pop Haydn combines wit, humor and audience participation with unbelievable sleight-of-hand to weave a spell of enchantment and fun. With the look and character of the turn of the century medicine show pitchman, Pop has sincerity and believability down pat. With his genial warmth and wry wit, Pop makes you want to believe in magic, and with a mischievous wink, he makes it happen. 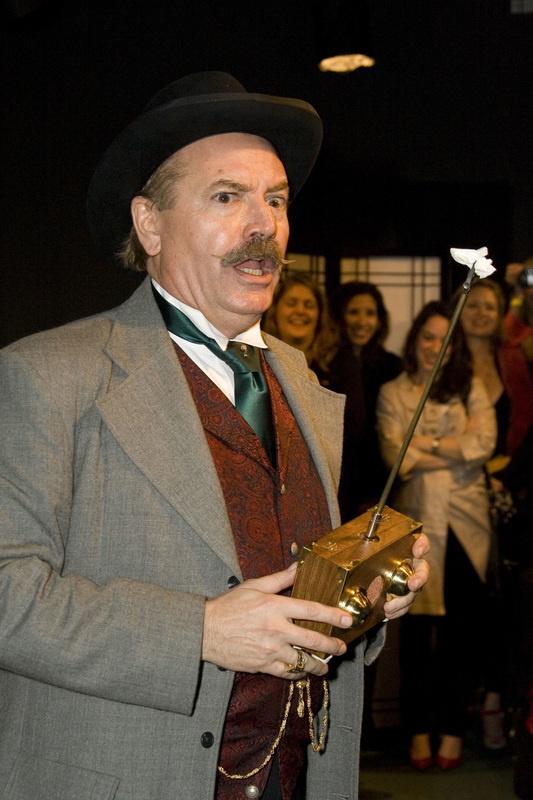 Using everyday objects such as an egg, a rope, a scarf and a newspaper, Pop turns classic magic inside out–the magician seems lost as the magic happens in the hands of the spectators. Pop has three different thirty-minute standup shows, as well as a 45 min and a one-hour show. He can perform in even the most difficult circumstances, whether on stage, in a banquet room, or three-quarter-round cabaret, and in front of any size audience. Because he depends on pure sleight-of-hand rather than large mechanical props or technical lighting and stage effects, Pop's stage, music and lighting requirements are kept to a minimum. People that come to your event should have their heads examined! Tired of Tarot Readers and Palmists? Want something more fun and interesting? 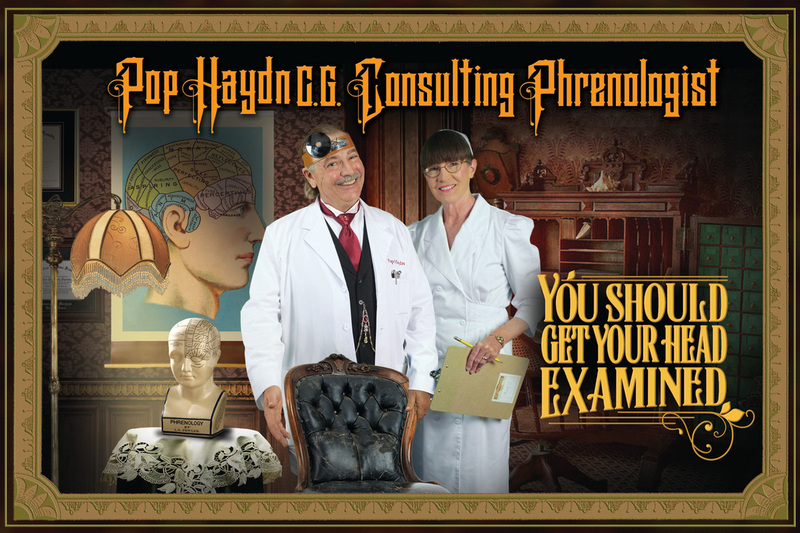 Phrenology is a fascinating pseudo-science that became a phenomenon and parlor entertainment during the mid-19th Century and up until the 1950’s. It was studied and discussed at all levels of society, and promoted by famous intelligentsia like Thomas Edison and Henry David Thoreau. Pop Haydn is one of the country's experts on the history and methodology of street scams such as the Shell Game, Fast and Loose, and Three Card Monte. He has taught a course on these scams at the Magic Castle for the last twenty years, and has authored books and DVDs on the topic. 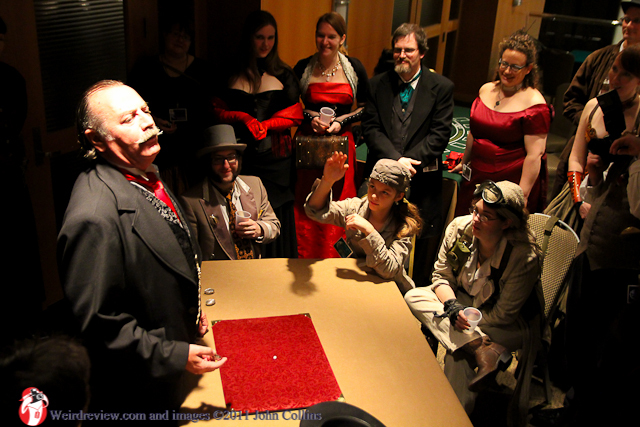 As something special to add to your Casino Night event, Pop Haydn can man a table that takes peoples money just as fast as they bet it. People are amazed and delighted by the ingenuity and skill, and don't mind losing when it is so much fun! It is also a way to increase the sales of betting chips at fundraising events, as the patrons have to buy more chips to play at blackjack and other tables. This is a truly unique and fascinating presentation that will have your guests talking for days. 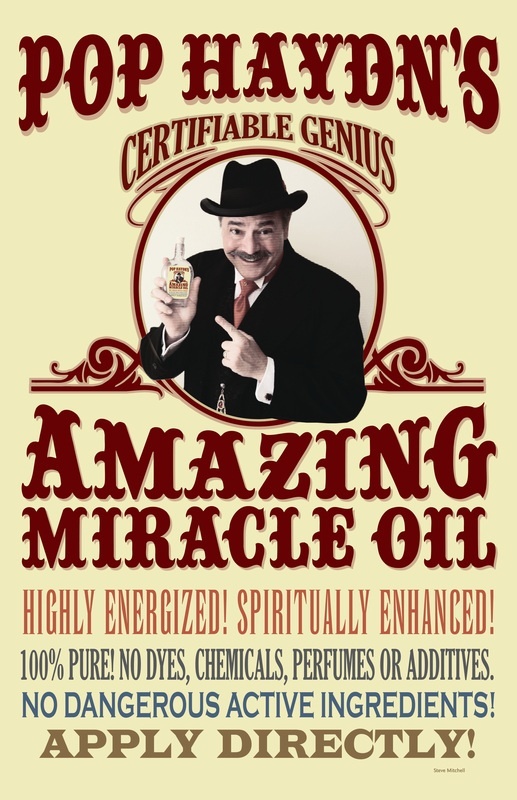 In the Medicine Show Pitch, Pop draws a crowd and entertains them and then pitches them his Amazing Miracle Oil. 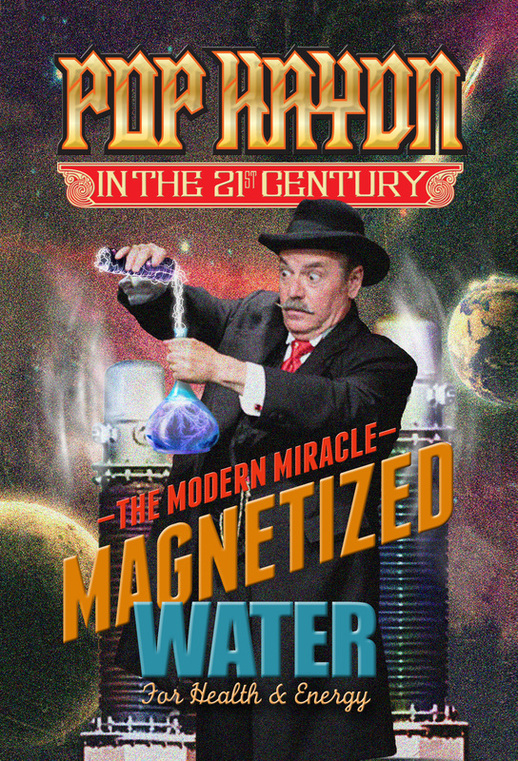 In this short, but informative presentation, Pop explains the myriad benefits of his many miracle products which also include the Wonder Elixir, Pop Haydn's Sap Rising Spring Tonic and Magnetized Water. 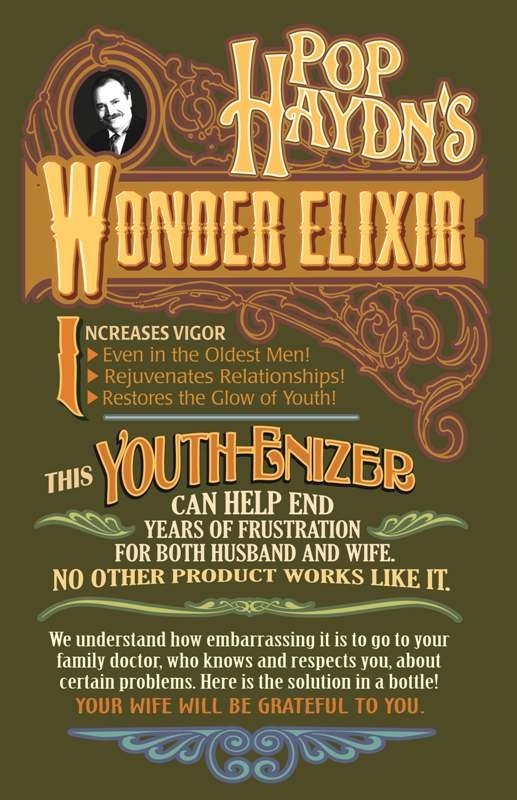 This is not a historical recreation, but a contemporary satire on medicine and quackery and television commercials in the style of the old style medicine show huckster. It is funny and wise, and keeps people laughing and thinking all the time. This is perfect for circus, carnival or sideshow themed events, Old Western, 1920's, or Steampunk themed events. Pop actually can sell the bottles or arrange to have the guests keep a souvenir bottle.